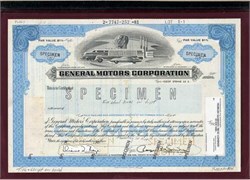 Beautiful RARE Specimen Proof certificate from the General Motors Corporation dated 1985. This historic document was printed by the American Bank Note Company and has an ornate border around it with a vignette of men next to futuristic looking vehicles (at the time). This item has the printed signatures of the Company�s Chairman, Roger Smith and Secretary, and is over 25 years old. This working proof certificate came from the archives of the American Bank Note Company and is in a holder provided by the company. General Motors Corporation (GM) (Pink Sheets: GMGMQ) / (OTCBB: GMGMQ) is a U.S. automaker based in Detroit, Michigan. GM is the world's second-largest automaker, as ranked by global unit sales for 2008. The company is continuing its operations while in bankruptcy proceedings before a U.S. federal bankruptcy court. GM was the global sales leader for 77 consecutive calendar years from 1931 to 2007. It manufactures cars and trucks in 34 countries. GM employs 244,500 people around the world, and sells and services vehicles in some 140 countries. In 2008, 8.35 million GM cars and trucks were sold globally under the brands Buick, Cadillac, Chevrolet, GMC, GM Daewoo, Opel, Vauxhall, Holden, Pontiac, Saab, Saturn and Wuling. In late 2008 GM, along with Chrysler, received loans from the American, Canadian, and Ontario governments to avoid bankruptcy resulting from the late-2000s recession, record oil prices, health care and retiree expenses, and heavy competition (see also automotive industry crisis of 2008�2009). On February 20, 2009, GM's Saab division filed for reorganization in a Swedish court after being denied loans from the Swedish government. On April 27, 2009, amid ongoing financial problems and restructuring efforts, GM announced that it would phase out the Pontiac brand by the end of 2010 and focus on four brands in North America: Chevrolet, Cadillac, Buick, and GMC. It also announced that the resolution (sale) of its Hummer, Saab, and Saturn brands would take place by the end of 2009. GM had previously eliminated the Oldsmobile brand earlier in the decade for similar reasons. As of April 24, 2009 (2009 -04-24)[update], GM has received US$15.4 billion in loans from the US Treasury Department under the Troubled Assets Relief Program (TARP). GMAC, a financing company held 49% by GM, has received US$5 billion in loans under the same program, while GM has received an additional US$1 billion loan to buy more equity in GMAC. General Motors Canada, 100% owned by GM, has received a combined loan commitment of C$3 billion from the Canadian and Ontario governments. General Motors filed for a government-assisted Chapter 11 bankruptcy protection on June 1, 2009, with a plan to re-emerge as a smaller and less debt-burdened organization in several months. The chapter 11 petition was filed in the federal court in Manhattan, New York. The filing reported US$82.29 billion in assets and US$172.81 billion in debt. As ranked by total assets, the bankruptcy is the fourth-largest in U.S. history, following Lehman Brothers Holdings Inc., Washington Mutual and WorldCom Inc.
General Motors (GM) was founded on September 27, 1908, in Flint, Michigan, as a holding company for Buick, then controlled by William C. Durant. It acquired Oldsmobile later that year. In 1909, Durant brought in Cadillac, Elmore, Oakland (later known as Pontiac) and several others. Also in 1909, General Motors acquired the Reliance Motor Truck Company of Owosso, Michigan, and the Rapid Motor Vehicle Company of Pontiac, Michigan, the predecessors of GMC Truck. Durant lost control of GM in 1910 to a bankers' trust, because of the large amount of debt taken on in its acquisitions coupled with a collapse in new vehicle sales. A few years later, Durant started the Chevrolet Motor car company and through this he secretly purchased a controlling interest in GM. Durant took back control of the company after one of the most dramatic proxy wars in American business history. Shortly after, he again lost control, this time for good, after the new vehicle market collapsed. Alfred Sloan was picked to take charge of the corporation and led it to its post war global dominance. This unprecedented growth of GM would last into the early 1980s when it employed 349,000 workers and 150 assembly plants. In late 2008 GM, along with Chrysler, received loans from the American, Canadian, and Ontario governments to avoid bankruptcy resulting from the late-2000s recession, record oil prices, mismanagement, and fierce competition (see also automotive industry crisis of 2008�2009). On February 20, 2009, GM's Saab division filed for reorganization in a Swedish court after being denied loans from the Swedish government. On April 27, 2009, amid ongoing financial problems and restructuring efforts, GM announced that it would phase out the Pontiac brand by the end of 2010 and focus on four brands in North America: Chevrolet, Cadillac, Buick, and GMC. It also announced that the resolution (sale) of its Hummer, Saab, and Saturn brands would take place by the end of 2009. GM had previously eliminated the Oldsmobile brand earlier in the decade for similar reasons. General Motors GMT800 truck assembly line.General Motors currently employs approximately 266,000 people around the world. General Motor's global headquarters is the Renaissance Center located in Detroit, Michigan, United States. In 2007, 9.35 million GM cars and trucks were produced in 19 different countries. GM is the majority shareholder in GM Daewoo Auto & Technology Co. of South Korea and has had many collaborations with the world's various automakers. This includes product, powertrain and purchasing collaborations with Suzuki Motor Corp. and Isuzu Motors Ltd. of Japan, advanced technology collaborations with Toyota Corporation and BMW AG of Germany and vehicle manufacturing ventures with several of the world's automakers including Toyota, Suzuki, Shanghai Automotive Industry Corporation. of China, AvtoVAZ of Russia, Renault SA of France, and most recently, UzAvtosanoa of Uzbekistan. GM also had collaborations with Fiat S.p.A (see GM/Fiat Premium platform) and Ford Motor Company. To this day, GM retains various stakes in many different automakers. According to at least one automotive columnist, as GM seeks aid from European governments in 2009 while acknowledging it has no alternative plan, and admits it is willing to surrender control of its operations in Europe to enable an infusion of cash, the "de facto deglobalization" of GM is in progress. The domain name gm.com attracted at least 7 million visitors annually by 2008.